What should I do, Oppo? This is partly your fault, Oppo, so now I’m asking for advice. So after talking with the guy who had that WRX I brought up yesterday, the Galaxy Blue Silica one, I decided to go looking. 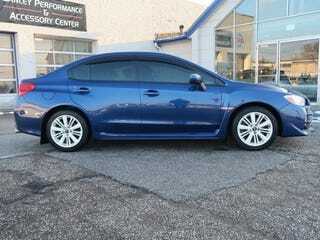 And I found a CPO 2015 WRX in GBS, base (I want base because no sunroof) with 41,000 miles for $19,990. The closest equivalent CPO car with similar miles in the country (The whole US of A) is priced $4,000 more than that. Normally I’d be wary, but it’s a CPO car from a Subaru dealership, so that means something. Actually worked out a deal with them that makes it very nice. The money difference is negligible from the Abarth, and I add a warranty, and I’ve wanted a WRX since we bought the Crosstrek and I got to test drive one. So there’s that. The Abarth is out of warranty, which is a little scary because I don’t have a backup car. Do we think this is a good trade?